Described as “one of the best-known and most desired high-end meat brands in the Upper Midwest” by Graze Magazine, Gunthorp Farms is a small family-run operation in northern Indiana very similar in method and philosophy to Ranch Foods Direct’s own Callicrate Cattle Company. Gunthorp Farms illustrates that the politics of food – like any other – sometimes requires taking a stand and firmly planting a foot. While family patriarch Greg Gunthorp watched the agriculture industry changing around him, he committed himself to two goals: 1) he would not be the last generation of his family to farm the lush rolling hills of northern Indiana; and 2) he would not be the first to raise livestock in large confinement systems. Since then, Greg has emerged as a national leader in the local food and farm-to-table movement with special skill in the art of raising pastured pork and poultry. He and his family adhere to regenerative farming practices designed to optimize the health of the land and livestock. He built his own USDA-inspected processing plant so he could process his animals right at the farm. Leading chefs soon took notice: his meat has been served in some of Chicago’s most famous restaurants, including Rick Bayless’s Fronterra Grill and the former Charlie Trotter’s. 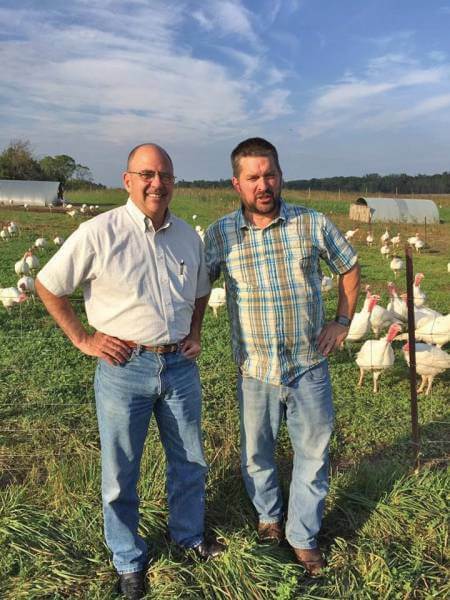 In October, Greg and his family invited Ranch Foods Direct owner Mike Callicrate to tour their farm and to participate in a round-table discussion with officials from USDA’s Food Service Inspection Service. They and other small farmers and processors had the chance to share their concerns about bureaucratic and regulatory hurdles that are forcing small slaughter plants out of business.